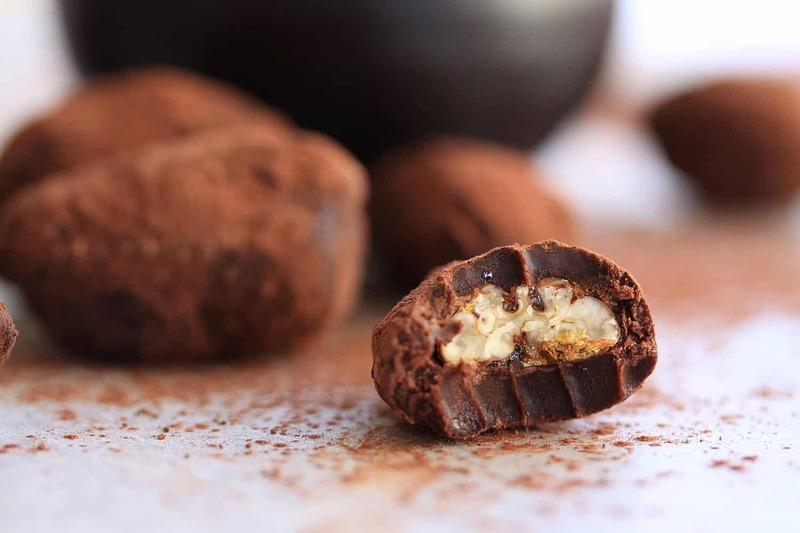 Decadent, luxurious chocolate truffles with a toffee pecan centre. I won’t say much in this post because, well……just look 🙂 OK, now use your hand to gently push your jaw closed again. Num, num, num. These chocolate truffles have been on my list for a while now and the final result was uh-maaaazing! The soft chocolate exterior gives way to these perfectly crispy sweet pecans. The cocoa on the outside is Dutch processed cocoa. No, no. You don’t need to wear clogs for this or own a windmill. Dutch processed cocoa is a dark, reddish cocoa and has a smooth, mellow flavour. It makes these chocolate truffles look super decadent. Take note of some very important points when it comes to making. This stuff can get very messy (or is that just me) so have some water ready to wash your hands every now and then. Using some hot water to just quickly warm the spoon before scooping helps. Make sure to use good quality chocolate at least 70%. It makes a huge difference. For that matter, use good quality everything if you can. There isn’t too much in these so there is nowhere to hide. Make sure to use that dutch process cocoa too. Now for some caramel making tips. Caramel is pretty simple to make but it can crystallise during the process and once that happens, there is really nothing you can do about it. I’ve made caramel like a bizillion times but for some reason, every now and then I feel like planets need to align or something. If you keep a few important points in mind you should have any trouble. Make sure your pan is perfectly clean and not non-stick. Stop stirring the second you see bubbles but make sure the sugar is dissolved before you let it start boiling. Even left over sugar crystals can cause the whole lot to crystallise. You can use a wet pastry brush to carefully brush down any splashes on the sides of the saucepan – another possible cause of crystallisation. If part of the caramel is colouring more than another part, just gently swirl the pan. Do not use any other implements at this stage. Once the caramel starts to turn, well, caramelly it all happens very quickly, so keep an eye on it so that it doesn’t burn. All those tips make this sound tricky but, I promise, it isn’t at all. 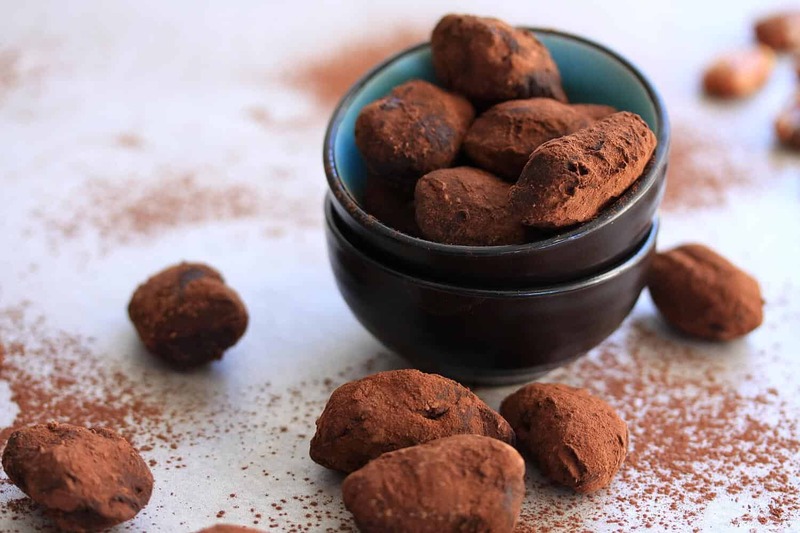 Chocolate truffles are so easy to make but they look so special and such a treat. Now, go make you some Toffee Pecan Chocolate Truffles. Set a cooling rack over a sheet of baking paper (to make clean up easier) and spray the cooling rack lightly with oil spray. In a small saucepan slowly heat the sugar and water, stirring until the sugar has dissolved. Once all the sugar has dissolved, bring the mixture to the boil. Stop stirring as soon as the bubbles start to appear. Continue to boil until the mixture is golden amber in colour. A drop of the caramel should harden quickly in some ice water. Remove the pan from the heat and straight away drop all of your pecans into the caramel and stir to coat them well. Working quickly, use forks to remove the pecans one by one from the caramel and place onto the cooling rack. Allow to set hard before using. Chop the chocolate into small pieces and place in a bowl. In a saucepan, heat the cream and butter until the butter melts then continue to heat, stirring until bubble start to appear. Add the vanilla and a pinch of salt and stir through. Pour the mixture over the chocolate pieces. Gently stir until the mixture is smooth and glossy. Place the chocolate mix in the fridge for 2 hours. 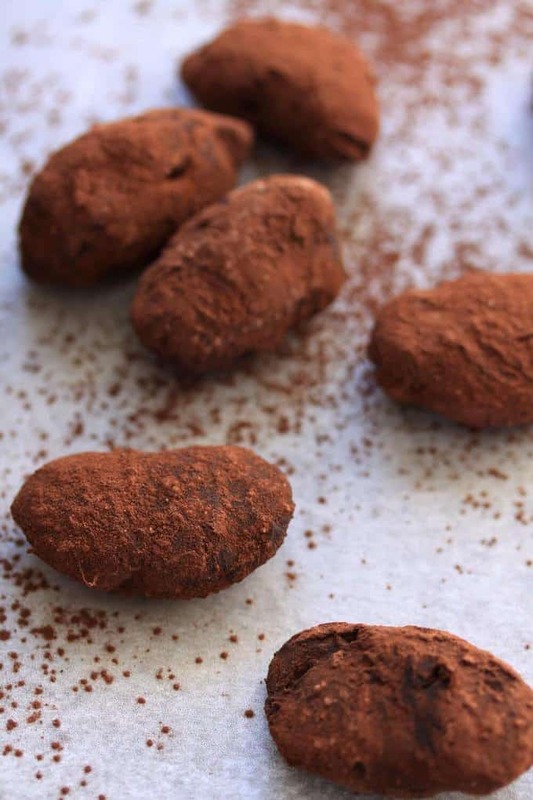 Take the chocolate mix out of the fridge 15-30 minutes before you want to make your truffles. Fill a cup with hot water. Dip a spoon into the hot water, scoop out a half to full teaspoon of chocolate, push a pecan into it then use a second spoon to scoop out another half to full teaspoon of chocolate and place on top. Use your hands to roll it into an oval ball. Drop the truffle into the cocoa to coat then place on a plate. Once they are all done. Place in the fridge to set again.